Woodland views,sun-trap shared Pool,Games field,Boules,Croquet, friendly Hens. 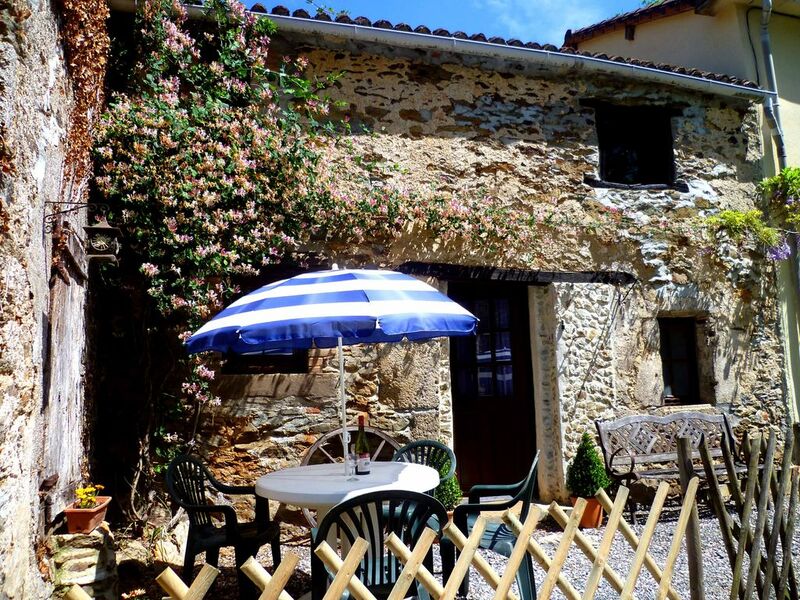 Les Petites Pierres ,or 'little stones' , is a 2 bedroomed Gite, sleeping up to 5 plus cot.A charmingly renovated 18th century cottage furnished to a high standard throughout. The comfortable lounge/diner has a 'typically French' feel with original oak beams, a solid oak fire surround and a woodburner for early/late season stays.There is a TV,Video/DVD player ,CD player and a selection of DVDs, books and games. There is free Wifi available. The well-equipped kitchen contains the Gas Cooker, Fridge-Freezer, Microwave and Washing Machine. The shower room and toilet has a shaver point and heated towel rail. The 2 bedrooms have original oak beams and views over the woods at the front. There is one double and one twin bedroom, and the latter can accommodate a child with the provision of an additional bed. Stairgate at top of stairs. There is a private patio with table and chairs for sitting or dining at the front of the Gite , and a private garden across the chemin, with a table,chairs and BBQ. Both are ideal for relaxing and enjoying the woodland views , with perhaps a glimpse of our Wildlife, whilst enjoying a glass of wine. Behind the Pool terrace there are washing lines for each Gite. Set in a glorious sheltered sun trap, the large shared Pool ( 9m x 4.6 m and 1.2m deep) is surrounded by a large sun deck.Loungers, chairs and parasols are supplied for relaxing and sunbathing after a refreshing dip. The tranquil setting is surrounded by woodland views. There is a Paddling Pool and some toys available. The Pool is covered at night, to preserve its temperature with daily opening and cleaning undertaken by ourselves. The Pool is fully fenced , has a security gate, and is open from May until October. There are a number of benches positioned around the site to take in the fantastic views. At the top of the site, is our large well-equipped Games field where you can enjoy - Football,TableTennis, Badminton.There are also a number of other bats and balls provided. Organic veg ius available, at cost, from our feature 3 - tiered Potager, there is a Wildflower Maze, a Croquet lawn and a Boules Court. There are wonderful walks on our doorstep and we also have 3 adult bikes available. Eggs from our friendly cheese loving Chickens are also available. We are within an easy drive of two of the top theme park destinations in France , Futuroscope at Poitiers,which has a large number of interactive games,rides and attractions, and Puy du Fou which has a 'Hollywood style' outdoor gladiator and viking shows, falconry exhibitions and a spectacular outdoor 'sound & light' show in the evening. The Marais Poitevin (Venise Verte),is a fascinating area of meadows and marshlands, criss-crossed by canals and rivers where you can hire a boat and spend the day meandering through the waterways. Coulon is an excellent starting point, and from here you can also take a ride on the Pibalou miniature train. At the seaward edge of the Marais, there are opportunities to go birdwatching and there are beautiful beaches at the seaside resorts of Les Sables-d'Olonne and La Tranche. South of Chalans, strong muscles will be needed to pedal the Velo-Rail trucks along the disused tracks - 2 to pedal and 2 can relax as passengers! For steam railway enthusiasts, there is also the Chemin de Fer de la Vendee at Mortagne sur Sevres 10km from Cholet,a 22km stretch of track, complete with dining car and a small museum. As you would expect in France, there are a number of opportunities for cycling - the Tourist Offices often have informative leaflets about routes.There is a cycleway running the length of the Vendee coast and 60miles of cycle tracks on the Ile de Re (La Rochelle) - with a Velo-Bus to come back on if required! Also very popular is hiring bikes to explore the Marais Poitevin - excellent flat easy riding. Within 30 mins drive there is an excellent 18-hole golf course at Mazieres-en-Gatine, overlooked by a spectacular chateau. Locally, there are several 'plans d'eau' which have a large lake for swimming, usually with a man-made beach and waterslide and many activities such as pedalos, water sports, crazy golf - something for all the family. For the fishermen/women, the fantastic Pescalis, Europe's premier fishing complex is just 10 minutes drive away. It has more than 250 acres of lakes with carp up to 25 kilos! Only 10 mins away is the Parc Aventure, tree-top fun for all ages and very popular with our visitors, and an excellent Karting track. For something 'completely different' travel underground at the Faymoreau Mining Centre,and don't miss the beautiful stained glass in the Chapel. There are many walks in the area - a number to take from Les Glycines Gites. There is a route which takes you through the many Apple Orchards that surround us and slightly further afield, one which tracks the 'famous 'Chabichou' goats cheese. Just north of L'Absie is the Rocher Branlant - the 'rocking rock'-a huge balanced boulder which moves very slightly when pushed! The Forest of Secondigny is the meeting place of 2 Santiago de Compostela routes (GR364 and GR36 - which starts in Plymouth). Local Markets in the area, of which, there are many for each day of the week, and a fantastically rich way to experience French life and Food - look out for Goats cheese, melons, Parthenay beef and Pineau des Charentes. The 'Departement' of Deux-Sevres,is so called after the two rivers which run through it- the Sevre Nantaise and the Sevre Niortaise. There are many lakes and waterways throughout our area which make delightful walks, and create dramatic settings for a number of the local towns and cities. Only 25 minutes away is the lovely medieval town of Parthenay with numerous half-timbered houses, museums and historic Churches. A ramble through its streets is a must. Niort , a similar distance, with its trendy and traditional shops and lively market, filled with a huge variety of fresh produce including seafood and patisserie. Poitiers also has a medieval centre and a number of architecturally interesting churches,including the ancient Saint-Hilaire-le-Grand, which was completed in 1049. The picturesque seaside resort and port of La Rochelle with its beautiful beach, many shops and variety of restaurants is readily accessible. In the forest of Mervant, Vouvant claims to be one of the prettiest villages in France, and it certainly makes for an interesting walk. The Melusine Tower provides a panoramic view over the village and surrounding countryside - it also has a fascinating story attached - look out for the Fairy Melusine with her serpent tail. If even more ancient history is your thing, then the important megalithic site of the Tumulus de Bougon with its combination of 5 tumuli,museum and reconstructions will be a must to visit. Very near to Les Glycines ,are the medieval ruins of the Abbey of L'Absie,which is associated with Eleanor of Aquitaine, the wife of Henry ll . At Secondigny, less than15 minutes away, not only is there a superb lake with fishing, restaurant and activities, but a beautifully restored Church of some note. At St Maixent-L'Ecole there is a reconstructed Gothic abbey church worthy of a trip. With more 'ornate' architecture in mind our nearest Chateau is at Coulonges sur L'Autize, conveniently situated in the centre of the town ,with the Chateau et Jardin Medieval de la Guyonniere just to the east of us ( south of Parthenay). To the North is the renaissance Chateau d'Oiron and the magnificent Chateau at Saumur, with its stupendous views over the Loire, can make a magnificent day out. We purchased Les Glycines Gites in July 2010 having both been self-employed in the UK . Anne's business was Heaven Scent Herbs - making speciality Mustards, Ray ran an educational evaluation consultancy. We moved from Devon with our two Burmese Cats, Merlot and Muscat ( now 15!). The beautiful and relaxing setting. The rich soundscape - birdsong, rippling brook. The sunny days and warm evenings . The position which is convenient for all travel options and for many wonderful days out. The lovely wooded valleys. toilet, shower, Light and airy downstairs shower room. We have lines for drying . Lovely traditional cosy cottage lounge. Comprehensive range of items. More than ample for 5 guests. Badminton,Table Tennis,Football, Boules, Croquet all available. Set in a glorious sheltered sun trap,the large shared Pool(9mx4.6mby1.2m deep) is surrounded by a sun deck. Loungers,chairs & parasols are supplied for relaxing & sunbathing.Paddling Pool available. During July/August we have daily fresh bread deliveries from a local artisdan baker - delicious Pain au Raisins etc... Feeding the Chickens ( much loved by children of all ages) - trying their delcious eggs! Organic vegetables are also available for a small charge. We live on site, so are able to give advice,book restaurants and make your stay as comfortable as possible. The cottage was cosy, comfortable & well equipped with a BBQ in it’s own garden area. The pool was immaculately clean & the gardens well tended with a great games field supplied with lots of equipment. Anne & Ray were fantastic hosts, very helpful and have lots of local knowledge of what to do & where to go. Nothing was too much trouble for them, as they kindly made bookings for us at a local restaurant & for horse riding and arranged for fresh bread & croissants to be delivered daily. We had a lovely relaxing stay and enjoyed the local walks, with days out to explore by cycling & boat and making new friends with the guests staying in the neighbouring cottages. Thank you Anne & Ray! So glad you enjoyed your stay in Les Petites Pierres Gite.Thank you. Poitou-Charentes is claimed to be the second sunniest region in France, and yes, we do get a great number of gloriously sunny days here with beautiful clear blue skies. There are between 2000 and 2600 hours of sunshine each year with an average rainfall over the summer period at approximately 2/3rds of the UK. Statistics aside, it is the afternoons and the evenings that are particularly warm and clear - just right for relaxing al fresco. In Spring we enjoy the freshness of the countryside and the beautiful chorus of Birdsong. Summer can be hot - but we have plenty of shade and our lovely Pool to cool down in. The Autumn is usually very warm, bright and dry - with small Butterflies still feeding on the Wild Thyme in late October . All year round, you will enjoy the truly peaceful surroundings and our rich wildlife. Our location in this beautiful rural environment, is an ideal base for exploring the area, whether holidaying or house-hunting. Within an hour's radius you can access the Atlantic Coast, Futuroscope, Poitiers and Puy du Fou. Within half an hour you can reach the cities of Niort, Parthenay, the beautiful 'Green Venice' of the Marias Poitevin, Vouvant and the Mervent Forest. Even closer, there are adventure parks, lakeside beaches with pedalos and kayaking, karting,horseriding,Pescalis the huge fishing complex, and , importantly ,a number of good restaurants. There are many glorious walks on our very doorstep! We have 3 adult bikes onsite to take advantage of our lovely surrounding countryside ( maps available). Masses of varied local wildlife including - Buzzards,Owls,Golden Oriel,Firecrest,Kingfishers etc, Wildfowl,Lizards and Bullfrogs,many Butterflies enjoying our own Wildflower meadow. Rates include electricity,gas,bed linen, hand and t-towels, plus a 'Welcome Pack' for weekly stays. Bath towels are available to hire on site at 15€ per week for 4 towels.We have CotsCot Mattresses,High Chairs, and other Baby equipment available - but please bring your own cot bed linen.Please bring your own Pool towels. Discounts are available for booking more than 1 Gite - please enquire.